I have a friend who I met on Facebook and some other online programs we belong to, and she is here to talk about her gardening journey, and maybe we’ll talk a little bit, she has an amazing podcast where people have had a second chance… I’ll let her tell you about it! On my podcast I interview people who have over come tremendous difficulties, sickness etc things like that and they have gone on to do inspiring things like you have created this podcast and thanks for having me here! Now you’re in British Columbia are you on the coast by the Pacific Ocean? I live in Coquitlam, BC, Canada which is about an hour from the ocean, about an hour East of Vancouver… live in the mountains in a brand new development, so there are no yards, so the grass has been taken out and a garden has been put in. I grew up in Prince George, about 10 hours north of here, I don’t remember my first gardening experience because my mom always gardened. So I would have been out in the car seat watching her. The very first thing I really remember is when she would give us jars to catch honey bees and now as a mom, I’m not sure if that was just about gardening or if she wanted a little time to herself?! I wondered that about my mom too, I mean don’t get me wrong my mom begged me to help because into into in the in the and I didn’t want any part of work in the hot sun but she was always out there, was she just as good with that to have a little space, I mean don’t get me wrong she was an amazing mom, she took us everywhere but anyway… catch the honeybees… so then did she grow organically? Yeah, I think my mom had 5 brothers and sisters, so she learned to garden organically, so I learned from her and my aunt… once I was on my own, my in the was an organic gardener and he took an entire city backyard and turned it into a garden! Wow! It’s nice to grow up near places like that isn’t it? Now, you have 3 children correct? Do they like to be in the garden with you? I find the little ones do, once they hit about 12 they don’t find it as exciting anymore. My tomatoes were my favorite this year… Every year I have so many Absolutely IDK what to do them all at the same time! So last year I staggering planting them by a few weeks and I found this year it was perfect! So I had a lot ready, and I’d take some to work… and give them to friends and then a few weeks later there were more! What’s your season like there? Her stuff is just beautiful! That’s what I want to try next year! IDK compost is one of the few gardening jobs I’m good at… you know what when I worked at the golf course this summer they were happy about me taking the compost, so if your friend already has the compost from experiment… you could find another place pretty easy…. The big thing for me is grass clippings, but if you don’t have a yard right now, maybe leaves, leaves are big right now! They might be happy to have you pick it up because they would not have to deal with it… I was surprised how much I could take home just on my shift… the other cooks would help me… because my boss cared about the environment and they were happy to have me recycle it! IT was less garbage to haul too! This year, it’s probably my 15th year on my own and… IT was the first year my beans didn’t grow any gardening, I didn’t have one bean! MMM why do you think that was? old seeds or the weather? Cold? IDK, everybody knows I’m not the worlds best gardener, for me it fruit sounds like a pollen almost problem. cold it be if you have flowers and no almost… I’m like the worst scientists.. it makes me think, we used to have that problem with the eggplants. WE’d get gardening flowers and no fruit. And one of the problems was we put the plants in different beds a tomato here and there and around the garden.. then he put them in one beautiful like a block of eggplants like a block of corn… now he seems to think he has that club thing mastered… but I think maybe it’s the pollen? Mike like bush beans, I asked how come he doesn’t plant pole beans anymore cause it’s just too heartbreaking when your just about ot harvest and they freeze! 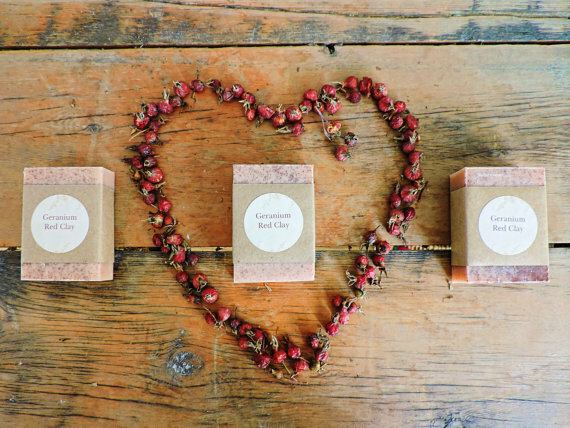 You can win a healthy fabulous bar of soap from Simply Josephine by leaving a review on iTunes and entering our giveaway There’s Geranium Red Clay, Lavender Oatmeal, Lemon Eucalyptus, and Lemongrass Cornmeal! So four winners can each win a lovely scented bar of Dacia’s wonderful handmade soap. Yeah! The harvest! I just, I feel so sad when I have to pick everything so I like to leave it, and when the frost comes it destroys it all! To me it gets a little time consuming to do the harvest… IDK how Mike picks al the beans and then he’s gonna snap all the beans and then can all the beans… I’m more likely to enjoy a garden where I just pick what I am going to eat that night… It is sad, I have a hard time with the flowers too, and bringing them in, I just like the way they look in the garden so pretty although I’m getting better about deadheading! Yeah that or a big difference! That sounds so nice! Definitely smelling the herbs is really nice! Best advice was from my neighbor, he told me to poke holes all around the tomatoes about 1/2 foot away… that would keep the dirt loose so the air could get in there… ever since then my tomatoes have just makes in size and volume! That sounds important to keep your tripped tomatoes… so how big and with what a aerated pinky or a stick? And how deep? Mine are just straight in the ground. That’s one thing that I think has always helped Mike is he puts them in these deep beds Tomatoes are like 3-4 feet deep. If I could only take one thing I think I would have to say my shovel. curry chicken with fresh cilantro or a greek salad! 1/4 cup of cilantro but I put a ton of fresh cilantro! In all honesty I just use Google because my mom has been such an amazing resource to me?! And I think those three things are just magical in a produce store to me! I business this that is awesome advice and what a great way to hear from your customers! Mine’s probably pretty small and simple and what your doing with your kids and your school would be a great start because I would like to see gardens in every think and see every community is responsible to grow their own food and seasonal produce to start! iAww do you neighborhood have a community garden in your community? Our community garden is a probably 15 minute walk as much as I love community gardens, I think it would be amazing to see gardens in the community instead of this one designated spot where everyone goest to garden? IDK how many people but it is growing so quickly, there was 4 1/2 classes of 20 kids each! So that’s 100 kids that are five just coming into this little age. The schools I teach at are pretty big! There’s like 2000 students. There’s like 9 2nd grades and 9 3rd grades and the kindergarten was like a whole school! The school farming movement? Is there a garden movement? There seems to be a big movement neighborhood, the principal wanted to start a towards club, and gardening there like 5 clubs, a chess club, and a walking club, and a culture club, I’m gonna start and art club and a reading club and that’s it… so the fact that she wanted a gardening club is a good sign. And I’ve interviewed a lot of people about gardens in schools, as a matter of fact I just replayed my interview with Patti Armbrister who teaches horticulture is an amazing garden educator on the east side of the state! I do think there is a lot of that but we could definitely use more everywhere! To plant a garden, is to believe in tomorrow! First I want to thank you, I think you are creating an awesome resource for people to be able to hear tips from all around the globe and but those to their own use?! Well it’s because of guests like you! This year I’ve been more into who are growing small gardens for their families! Do yo want to talk about your story and podcast at all? For me gardens is a source of therapy. My story real quick, I was a commercial bus driver for 10 years and I had a heart attack and I was off for 2 years… and in those 2 years I spent so much time working in my garden and going for walks and listening to nature and Idk what I would have done without my garden… my little one was only 2… so I would get him to bring out his dump-trucks and he would play by me while I worked and I think that was some of our best time together! So that’s how my podcast started I just really are wanted to find people who had gone through what I was going through and see that they made it through and from there I went back to work and I started a brand new career and now it’s hard to keep my garden wanted I’m really busy but I still really love it!